I saw a map recently that put everything into perspective for me. It's titled "Spatial Mismatch" and was designed to show "how economic disparity and transportation are intertwined in Dallas." It was published as part of a study by the University of Texas at Arlington's Institute of Urban Studies (insert plug to support research and development universities here). What jumped out at me is something about, not public transportation, but education. Look at that map. The yellow areas are labeled "Hot Spot, Households Below Poverty Level, 2014." As expected, the map is bottom-heavy, with yellow stretching all across southern Dallas. But there's a splotch of yellow farther north, straddling IH-635 east of US 75. That's in Lake Highlands. That's in Richardson ISD. That's not unexpected either. After all, RISD just announced that it was going to implement the Accelerated Campus Excellence (ACE) program "to provide an educational environment in which students at high-poverty schools can achieve consistent academic success." (Good for RISD). The schools targeted are mostly in that yellow area. 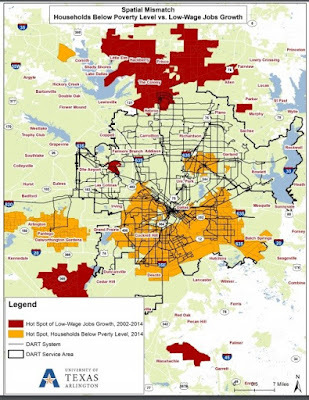 But what really hit me over the head when looking at that map is how there are no yellow areas in Plano, Carrollton, Addison, Farmers Branch, Coppell, Lewisville, Hebron, McKinney, Mesquite, etc. The yellow is only in RISD and neighboring parts of Garland ISD. This suggests a new way to look at test results, at graduation rates, at word-of-mouth reports, whatever you want. If you look at those things and see a declining school district in RISD, don't blame the teachers. It just might be due to, not anything happening or not happening in the schools, but due to poverty at home. On the other hand, if you see a good school district in the face of that poverty, thank a teacher.